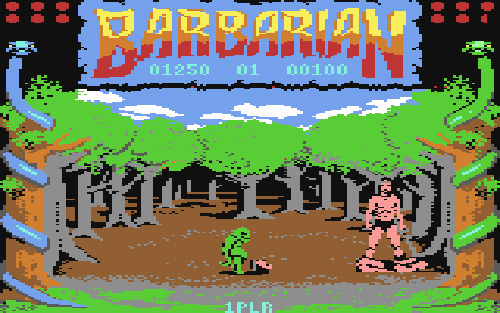 The Games We Played – Barbarian: The Ultimate Warrior (C64) | OhGizmo! 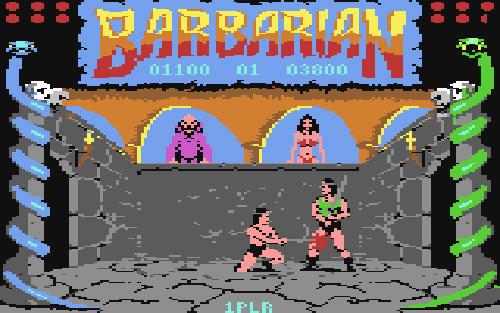 Long before Mortal Kombat hit the scene and got everyone riled up about video game violence, there was a game called Barbarian: The Ultimate Warrior which I played on the C64. (Though I only ever knew it as Barbarian.) It was your standard 2D fighting game, but instead of fancy martial arts or magical fireballs you had to rely on your sword and basic fighting moves like kicks, rolls and even head butts. Come to think of it the game was probably pretty accurate in that regard, since it supposedly took place during the dark ages. Two opponents of slightly varying color schemes would square off in a handful of medieval venues, and eventually you’d get to challenge a wizard who was the game’s final boss. For some reason though, my copy of the game was stuck in an endless loop, so no matter how many opponents I defeated (sometimes close to 50 before I gave up) I never actually made it to the final wizard stage. I loved this game. Played on Amiga 500 with my mate for hours on end, weekend after weekend. Same here – player versus player was great, you always wanted to finish your opponent off with the decapitation move. Ah, it brings back memories.